All young people at St. James in grades 7-12 are invited to serve as acolytes. After being trained by the Rector, acolytes serve in various roles during Sunday morning worship, and at other services as requested. The title ‘Acolyte’ is derived from the Greek word, ‘akolouthos’, meaning server, attendant or follower. The ministry of acolytes has existed nearly as long as there have been priests. In the Anglican/Episcopal church, as well as in the Eastern and Western Orthodox and Catholic churches, acolytes have served at the altar since ancient times. The acolyte’s service is an offering to God. At St. James, acolytes serve alongside our clergy in roles that express the liturgy of the Episcopal church. Carrying the processional cross, an acolyte leads the procession into and out of the church. 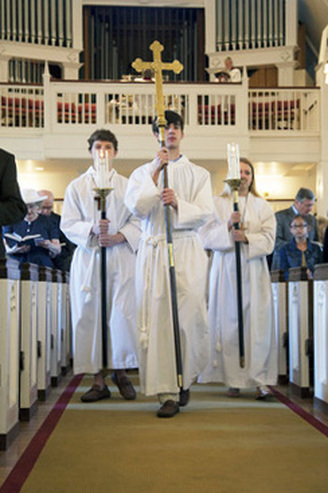 Leading clergy in the gospel procession, one acolyte bears the gospel and two others carry torches, signifying Christ’s light coming into the world as the gospel is read. An acolyte assists the presider at the altar; assists the ushers with offertory plates; prepares for the Eucharist by closing and opening the sanctuary gates. By participating in this ministry, acolytes perform major roles in the worship service. Acolytes also work closely with members of a larger worship team that includes members of the Altar Guild, Lay Eucharistic Ministers, Ushers, Choir, Lay Readers, and the Flower Guild. Glossary terms related to "acolyte"